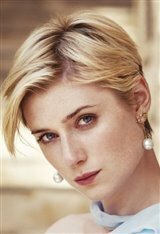 Born in Paris, France, Elizabeth Debicki is an Australian actress best known for roles in films such as The Great Gatsby (2013), Everest (2015), and Guardians of the Galaxy Vol. 2 (2017). Her Polish father and Australian/Irish mother were both professional ballet dancers. When Elizabeth was five, her family (Elizabeth also has a younger brother and sister) moved to Australia, where she followed in her parents' footsteps by pursuing an interest in ballet, before finally deciding on a career in the theater. Elizabeth studied at the University of Melbourne’s Victorian College of the Arts, graduating in 2010 with a degree in drama. Her first big break in the industry was as Maureen in the British/Australian romantic comedy A Few Best Men (2011), starring Rebel Wilson. Her next film was a role in Baz Luhrmann's The Great Gatsby (2013), with Leonardo DiCaprio and Tobey Maguire. For her work in the movie, she received a Best Supporting Actress award in 2014 from the Australian Academy of Cinema and Television Arts Awards. Also in 2013, she returned to Australia to in the play The Maids at the Sydney Theatre Company, alongside fellow Aussie Cate Blanchett, someone she has often been compared to. For her work in the play, Elizabeth won Best Newcomer at the Sydney Theatre Awards. The part of Lady Macduff in the British feature film Macbeth (2015) alongside Michael Fassbender and Marion Cotillard was followed by a starring role as Victoria Vinciguerra in Guy Ritchie's The Man from U.N.C.L.E. (2015), also starring Henry Cavill. In 2016, she played Jed Marshall in the award-winning AMC/BBC TV mini-series The Night Manager alongside Tom Hiddleston. The same year, she was cast in the lead role on the Australian TV series The Kettering Incident, playing a doctor whose best friend went missing 15 years earlier. Soon after she returns to her hometown, another girl goes missing. Elizabeth recently appeared in the Marvel ﬁlm Guardians of the Galaxy Vol. 2 (2017), in the role of Sovereign High Priestess Ayesha. She joined the cast of Hollywood heavyweights from the original film, including Chris Pratt, Bradley Cooper and Zoe Saldana. Also in 2017, she played the role of Pearl Emperor Haban-Limaï in another space travel movie: Valerian and the City of a Thousand Planets (2017), starring Dane DeHaan. In addition, Elizabeth has been featured in photo shoots for Vogue and Vanity Fair, and is one of the faces of the Australian-based Jan Logan’s jewelry.